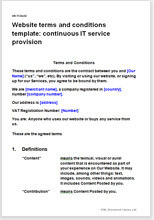 This website T&C is for a software or other technical business providing continuous work. By “continuous”, we mean work that continues until one side or the other terminates, as against a one-off service. Could be for a retail or business client. Perfect for a “cloud” service. Examples: web hosting; provision of statistics; Internet marketing; advertising placements. Extensive and detailed provisions to protect your IP and servers and to control what is allowed in postings. Because this is a website TandC document, we assume that all details of your service will be on your website. We have presented many options, each in simple terms so as to give you a menu of possibilities. There are provisions for what can be uploaded to your site, draft data storage provisions. There are special additional provisions regarding domain names which will not be required by every buyer of this document. Helps you to trade safely internationally, whether your customers are in the Republic of South Africa, UK or further afield. The law in these T&C is largely common law that deals with the basics of contracts: offer, acceptance, price and payment, delivery, returns, dispute resolution, liabilities and risk. Provided you comply with the law, you can set whatever terms you like. This template complies with consumer protection legislation allowing you to sell to businesses or consumers. Over 1,200 words of helpful and informative drafting notes.